Commemorative Postcard, Italy or Libya, ca. 1915, DR. In the midst of the last developments of liberated Libya, we’ve ‘forgotten’ to remember October 5th 1911*: the day the Italian army invaded Libya and started its colonisation. What’s the (political) meaning of commemorating history in Libya? This short article examines the political role of rewriting history in the context of Qaddafi’s regime and questions its future in the reconstruction of Libya. 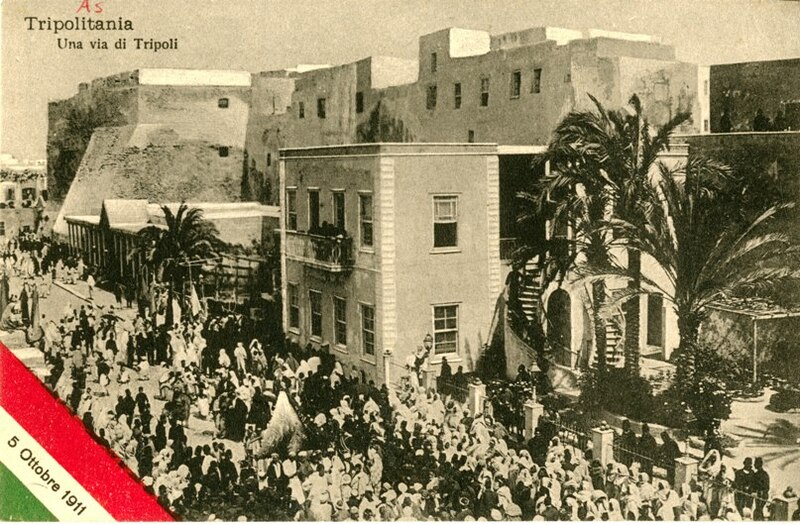 On October 5 1911, Italian troops invaded Tripoli of Libya. After months of rising tensions between Italian and Turkish (Ottoman) governments, the Italian Navy had started to bomb the port of Tripoli leading to the invasion of Tripoli and Tripolitania. It took few years to the Italian Republican and Fascist troops to conquer what was to become Libya in 1934 after Cyrenaica was conquered and united with Fezzan and Tripolitania. Ironically, the centennial coincides with the 150th anniversary of the proclamation of the Kingdom of Italy. 1861, 1911, 2011: history seems to defy common sense in mixing dates. One wonders how the former regime would have orchestrated commemorations… No doubt it would have been a great post-colonial show as the resistance of Libyans to the Italian colonisation had been erected as a fundament of the ideology of Qaddafi’s ‘revolutionary’ regime. This short article – these are personal notes and reflections- examines the political role of rewriting history in the Libyan context and its future in the reconstruction of Libya. it emphasised its works on the so-called the “forgotten people” of the (imperialist) history: the Libyan people. it stressed the unity of Libya as a country by developing a double nationalist discourse based on the Libyan territorial continuity and the Arab nationalism. On this discourse, Libya is an Arab country which was invaded by filthy colonial troops. Therefore, in Qadhafi ideology, Libyan history and territory appear as natural elements that had been corrupted by colons. it encourages the People [remember that the regime was the Libyan Jamahirrya, the Republic of the Great Masses] towards change. The publication of the White Book in 1981 [not to be confused with the Green Book published in 1975] brought up the idea that the ‘under-development’ of the country was the consequence of the colonial atrocities. Summing up, this rewriting of history meant that unity must prevail to build up a (revolutionary) future that needs to use historical ‘roots’ of the nation. Commemorating Postcard, Italy or Libya, ca. 1915 (? ), DR. The concept of the roots of the Nation is a problem by itself. However, cultural heritage (archaeological monuments, architectural heritage, turath) is a useful tool to draw the genealogy of the Libyan nation. But here starts the problem: most of archaeological monuments attest of a colonial or foreign presence on Libyan territory that denied per se the ideologicaly biased history of the regime. In a recent article (“Libya: the Arch of Silence”), I discussed that ambiguity regarding the Arch of Marcus Aurelius in the heart of Tripoli’s Medina (click here to access the article). The arch was restored on the first days of the colonial occupation as early as October 1911 in order to show the Italian prevalence on the territory. Later in the 1930s, it became a monument to the grandeur of the fascist empire, just as the monuments of Ethiopia were convoked to Rome. Analysing the colonial history and the post-colonial discourse, I arrived to the conclusion that the monument should have been destroyed by the revolutionary regime. What saved it? My hypothesis is that the monument was only accepted and preserved because it was surrounded with silence: no historical writing, no archaeological works as well as its absence from touristic brochures helped to forget about the Arch which didn’t fit the doxa of the regime. On the contrary, the Arch of Marcus Aurelius could have helped writing a history of shared past, a history of political violence as well as a history of diversity in Libya. Its presence was denied per se in the one-way history Qaddafi’s regime had promoted. On one hand, diversity was a denied to Libyan people: the nation was Arab, and only Arab. Berbers were deprived from their rights. On the other hand, the regime promoted tribal order as the basis of Libya social system. Tunisian anthropologist Mouldi Lahmar has shown that this tribal system was a recent construction inherited from… the Italian colonisation! (cf. references). As Qaddafi’s regime collapsed and the February 17th Revolution triumphed, the nation has to be reconstructed, literally. After decades of intertia due not only to the lethargic kleptomania of the regime but to its ideological grounds – that post-colonial Arab nationalism that led to support terrorism of all sorts and to the Western embargo (1992-1999), the unity of the Libyan nation has to be redefined. Which are the grounds on which the newly empowered people will build the nation? How the (not-so) subtle art of commemoration be used? How will history be re-written again? *I cannot forget the October 5th as it is my birth date. Note: original pictures are all property of Markaz al-Jihad, Tripoli, Libya. Thanks for sharing this article. Looking forward to more!